The Roswell Incident has become the most researched UFO events in history. On July 7, 1947 material was recovered near Roswell, New Mexico that would indicate that a UFO had been there. Since then there has been much speculation about what the US Government may be hiding from us in regards to UFOs and alien visitors. The Government claims that the material recovered was from an experimental high surveillance balloon belonging to a classified project known as “Mogul”. But many UFO advocates maintain that a crashed alien craft and bodies were recovered and that the military is covering it up. According to Roswell Army Air Field (RAAF), personnel from the Army recovered a crashed “flying disc” from a ranch near Roswell, NM. But the Army soon retracted this information and instead said that the debris was from a crashed weather balloon. The case was forgotten until 1978 when ufologist Stanton T. Friedman interviewed Major Jesse Marcel. 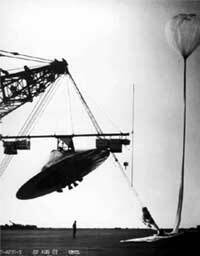 Marcel was involved in the original recovery of the debris in 1947. Marcel’s belief that the military had covered up the recovery of an alien spacecraft began circulating through UFO circles and featured documentaries. Additional witnesses and reports began to emerge adding significance and offering new details. These details included a large military operation dedicated to recovering alien aircraft and aliens from as many as 11 crash sites. There were also reports of witness intimidation. Former mortician Glenn Dennis came forth in 1989 with claims that he performed alien autopsies in the Roswell basement. The General Accounting Office launched an inquiry and directed the Secretary of the Air Force to conduct an internal investigation. Two reports were released, one in 1995 claiming that the debris recovered in Roswell in 1947 was likely the debris from a secret government program called “Project Mogul”. 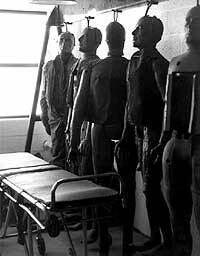 The second report released in 1997 suggests that claims of alien bodies were likely transformed memories of military accidents involving injured or killed personnel or possibly the recovery of anthropomorphic dummies from a military program known as “Project High Dive” that was conducted back in the 1950’s. William “Mac” Brazel, a foreman at the Foster homestead about 30 miles north of Roswell found strange clusters of debris. Brazel and his son claim they found a large area of bright wreckage made up of rubber strips, tinfoil, a rather tough paper and sticks. He and his wife returned to the area a few days later to clean up the debris. The next day Brazel heard reports on the news about a UFO crash and confided in the Sheriff that he may have found the disc. Major Jesse Marcel and a man in plainclothes went to the homestead, after the Sheriff notified Roswell Army Air Field, to gather up the debris. The incident was pretty much forgotten until 1978 when former nuclear physicist and author Stanton T. Friedman interviewed Jesse Marcel. This interview elevated Roswell from a forgotten incident to the most famous UFO case in history. Stanton Friedman and a team of UFO researchers continued to interview several hundred people who claimed to have had a connection with the events at Roswell in 1947. Their conclusion was that at least one alien aircraft did crash in the vicinity of Roswell, NM and that still alive aliens were recovered and there was a massive cover-up of the incident.